The much needed renovation works to restore the neurosurgical division of the Astvatsatsin Hospital, Yerevan, Armenia started in April, 2006. The project is a continuation of the previous restoration works done for the somatic division (a division for children with issues such as malnutrition, lack of normal growth and other developmental physical conditions) of the same hospital. The project is being sponsored by Mr. Agop Giritliyan, an Armenian philanthropist who was inspired by the success and well-maintenance of its first project in Armenia and thus undertook the renovation of the neurosurgical division of the children’s hospital. The project is scheduled to be completed by August 25, 2006. The state-of-the-art renovation of the division is a bold initiative to take the provision of adequate healthcare service to a different level. The right of every child and adult to proper healthcare, established by multiple international protocols and conventions, still remains an unaccomplished task for thousands of children in Armenia and Karabakh. 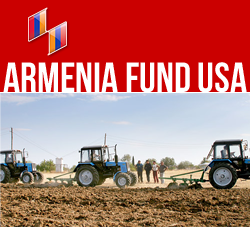 The Fund’s other projects in the area of public health and medical care include the Armine Pagoumian Polyclinic and Diagnostic Center in Stepanakert, Nagorno-Karabakh.